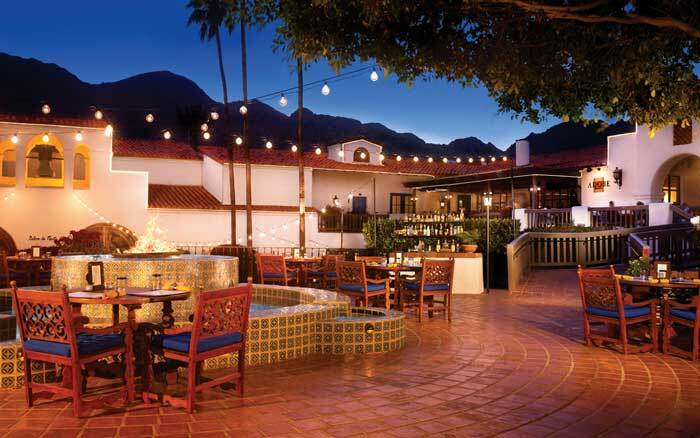 This past week, my husband Bill and I along with another couple decided to visit the Adobe Grill at the La Quinta Resort & Club. It had been years since any of us had eaten there, so we were looking forward to the experience. Entering the bright and cheery space that is upstairs and to the right from the main entrance to the Resort, we were promptly greeted and taken to a very nice table in front of the ten-foot tequila display. Keeping with the theme, we ordered a variety of different margaritas from our server Osvaldo, all of which were very tasty and not too strong. Mine was peach, and it was just the right balance of sweet and tart. You can’t go wrong with a margarita here as they offer more than 100 tequilas. We started out with their signature guacamole that our server made tableside. Just the right mix of avocado, onions, tomatoes, jalapenos, cilantro and lime juice served with very good tortilla chips that came with two different types of salsa. Bill asked about tamales, and the server had the tamale maker fire up a sample to try. The tamale was very good, so Bill and our friend Guy had some of these award-winning tamales served with rice and beans. They were moist and had just the right amount of masa in relationship to the fillings. My friend Terri had a chicken quesadilla, and I had the combo platter of a chicken enchilada and chili relleno. I ended up only eating half as I had enjoyed too much guacamole before dinner! The Adobe Grill is a colorful and happy place with a nice bar inside and during the season offers one of the best outdoor patios in the valley. On weekends, there is live music to enjoy outside among the citrus trees and a nice view too. It’s on the pricey side for Mexican food, but you are at a resort, paying resort prices. Summer Hours: Wednesdays through Sundays: 5 PM to 10 PM. Happy Hour from 5 to 6 PM.